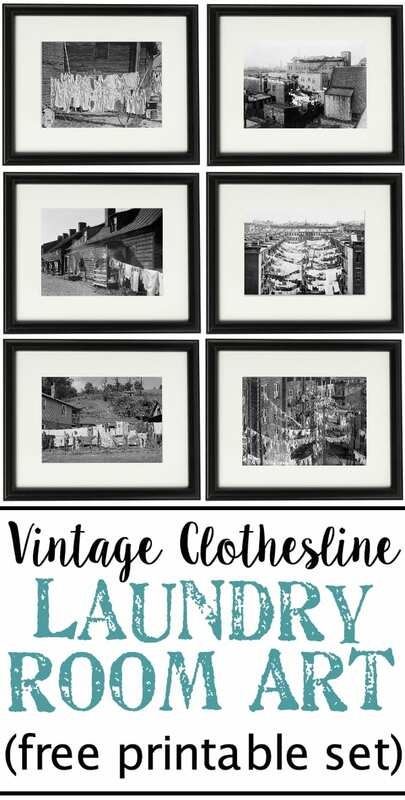 A free downloadable printable set of 6 vintage black & white clothesline cityscape and countryscape photos perfect for framing in a laundry room. Shameless Bragging Moment: I started hanging gallery walls before they were cool. And by “gallery wall”, I mean I cut up an old wall calendar of black and white photos of Paris and taped them in a grid to my cinderblock dorm room wall when I was 19. I’d never been so proud of 12 sheets of paper with secretly scribbled dates on the back of them. I wish I had a picture to prove it. But it was epic decorating for a college student. I really felt stuck on what kind of art to hang in here. I wanted something a little grown-up but still fun. And chic. Can we have chic in a laundry room where our dirty piles of jammies and underwear usually party? Really though… who’s going to stop you? One of my favorite ways to find free art when I want to decorate our walls on the cheap is to search for public domain images. 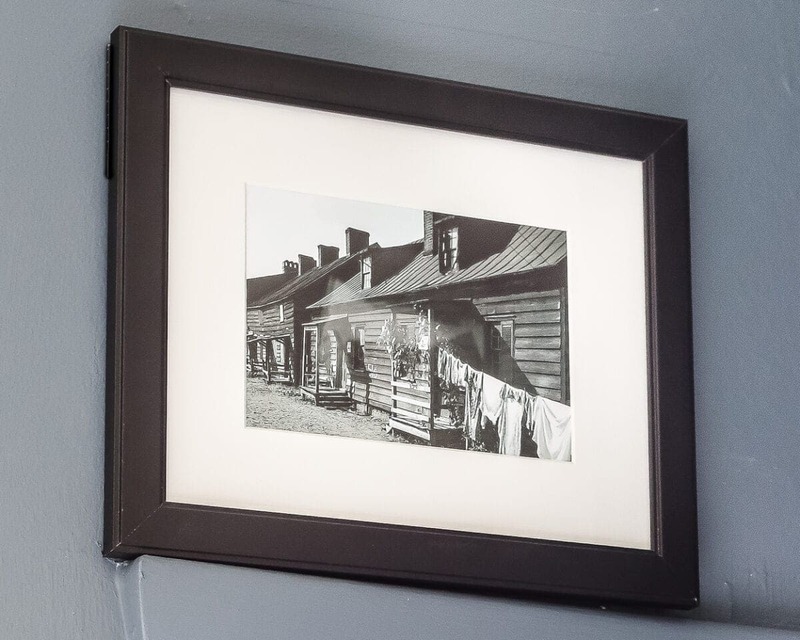 A lot of times, I can just search in the photos and prints archives on the Library of Congress website, which is where I found these vintage photographs of clotheslines. They’re so interesting to look at. And, honestly, they turn me into a giant sap. I’ll be thankful for my overflowing laundry baskets because I know theirs have long since been empty. The challenging part though was this annoying little electrical box smack in the way behind our washing machine. 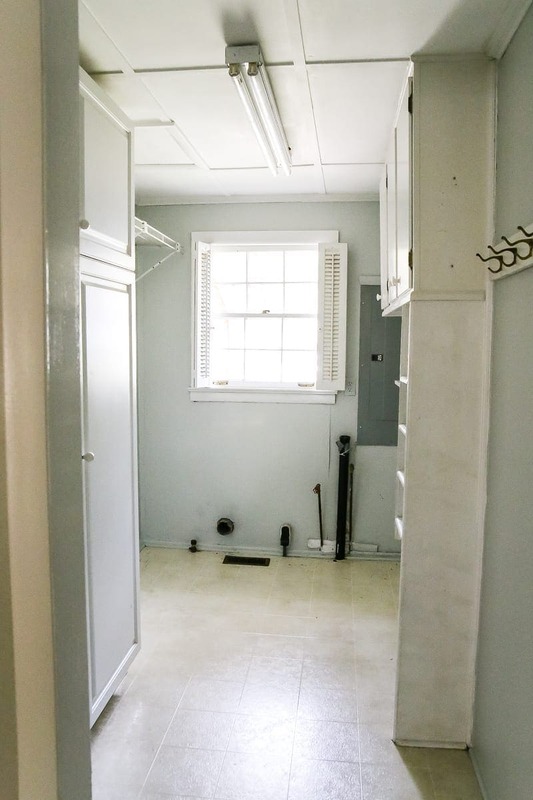 After our last laundry room update, a lot of y’all suggested ideas to cover it up, but the big problem with completely covering an electrical box is that if there’s ever a fire or an emergency of some kind, responders won’t be able to locate it. So I just painted it the same color as the wall and super glued these magnet sheets to the backs of the two frames I needed to hang on it. We can easily take them down whenever we need to access the panel and stick them right back up when we’re finished. It’s still not totally gorgeous, but it’s functional and tolerable. I decided to add a little texture in here with this driftwood Roman shade too. The sunlight pours through this window in the afternoons, so that helps. The spacing on the frames is still wonky, but considering the wall spaces on either side of the window were uneven and we had to work around a big electrical box and an outlet and a jutting out trim piece, it’s a huuuuge improvement. Do you have any other public domain resources for getting free wall art? Or have any vintage photographs hanging up that you love? Or a calendar you cut up in the name of cheap home decor? Aw thank you! I’m so glad you like it. Just checked out your laundry room. It’s so cute! Loving the addition of the cabinets! Paint the vinyl!?! Oh my, I need that info. Looking forward to your next post. I have a laundry room that needs an overhaul. Painting the floor would save $$ and come into my budget. It’s a heavily used floor since it’s the way we leave through the garage. 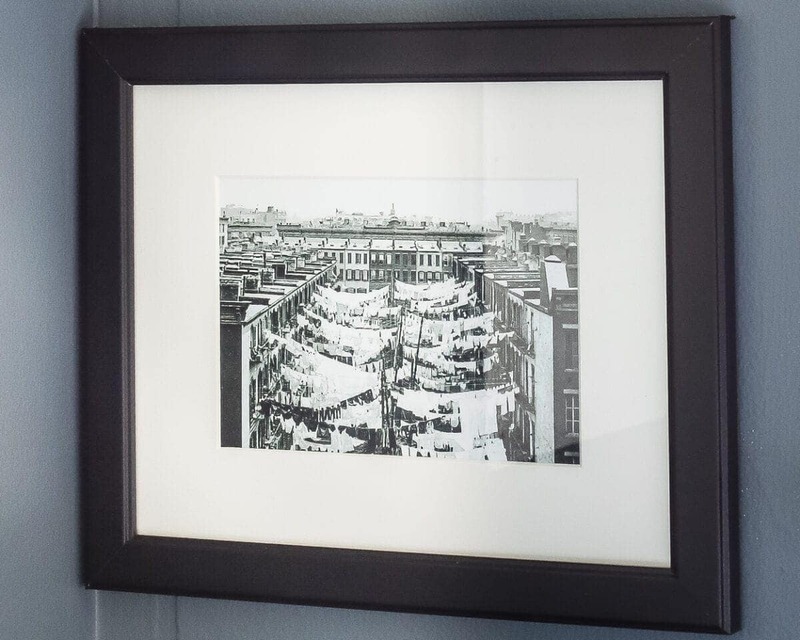 BTW, my laundry room has the vintage clothes pin bags that were used by the women in your photos. They are little dresses sewn across the bottom. Oh my, isn’t your washing machine brand new? What a shame about the water everywhere. That’s one reason I got the top loading HE. Good luck with the repairs…I know what a pain it is to be without a way to do laundry. I had to haul everything to the closest decent laundromat 20 miles away for a year until I got my new machines. 🙂 By the way I love your laundry room. Is the wall color a really dark grey or is it navy blue? Well, it turns out something wonky is going on with the drain in the laundry room. So… now a plumber is going to deal with that Monday. The washing machine is fine apparently. Ugh! Thankfully, my parents live 20 minutes away and we can go there if we need to. 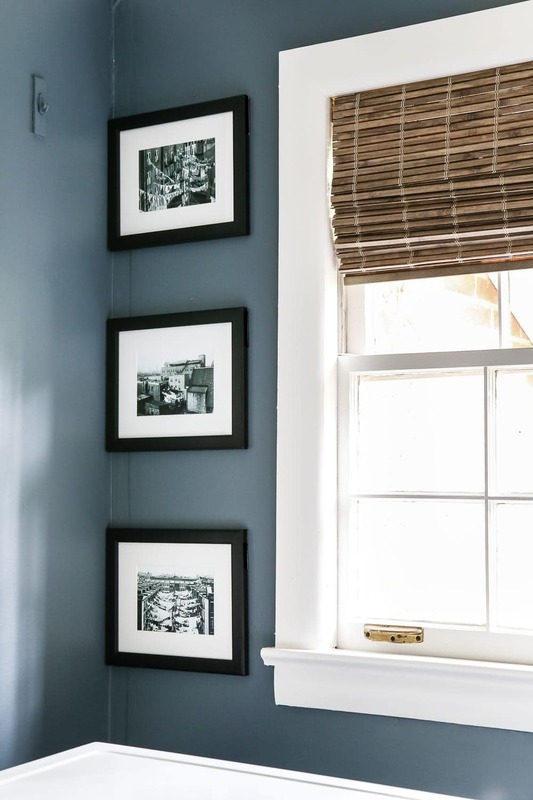 The wall color is called Sherwin Williams Slate Tile. It’s a very deep, muted blue. 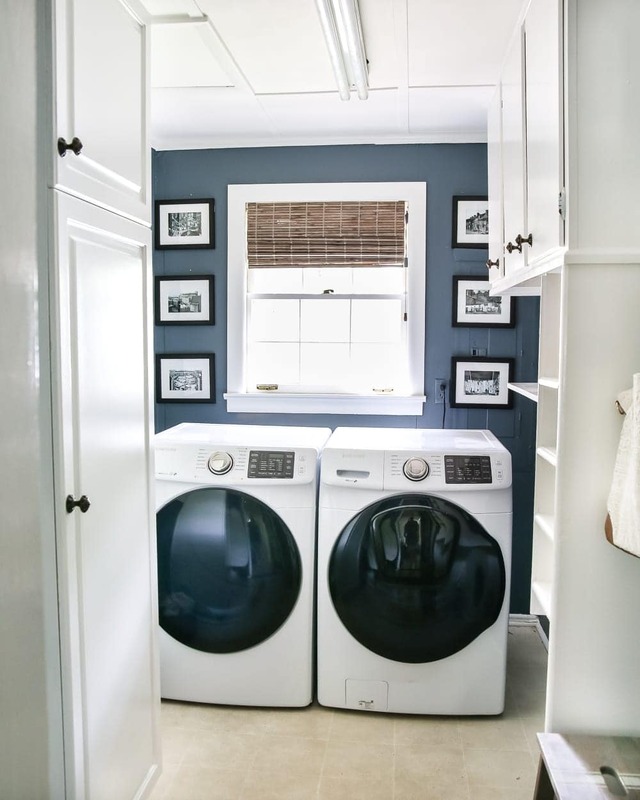 I’m loving your laundry room! I smiled at your description of your dorm room– I have 6 framed floral pictures from a calendar over my master bedroom bed right now! No less inexpensive art anywhere! 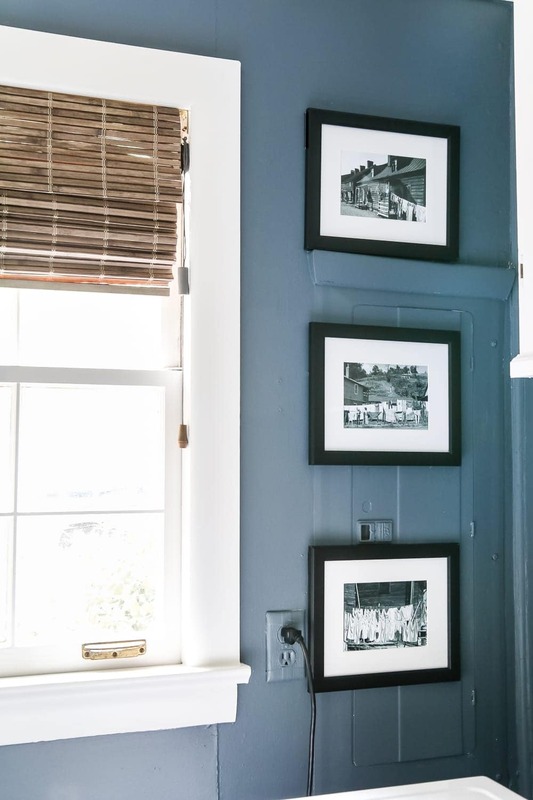 I’ll share another thing about my calendar picture art in case you want to borrow this idea sometime: I had found 6 framed prints at a yard sale– I didn’t care for the prints, but the frames were old and beautiful and the price was great! I replaced the prints with the 6 florals from a calendar. But what to do about the mats in the frames? I could frame the botanicals (?) without them at all, but I thought mats looked nice… I could replace the mats but 6 might get pricey… I could paint the mats but would the paper mat bubble? I looked at the pale green silk fabric that I was using to make bed cushions for the room and had an idea: I sprayed the mats with sticky spray and lay fabric on them, cut an “X” in the center and wrapped the fabric around all sides of the mat then fitted them back in the frames with the artwork. They turned out great and my bedroom art is very pleasing! I wish there was a way I could attach a photo here to show you. Can that be done? 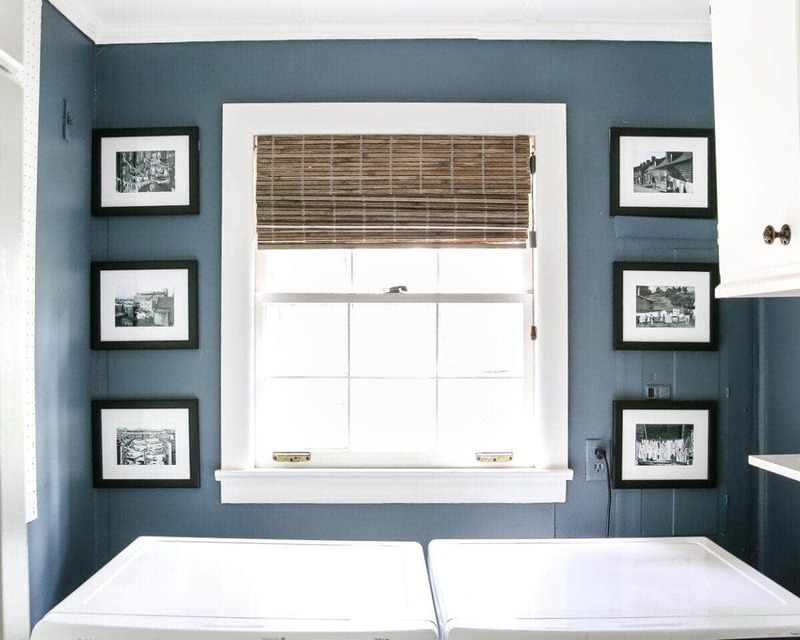 Again, love your laundry room, and I always feel a kinship with you when I read your posts! So smart! I think we’re kindred spirits, Shelley. 🙂 I don’t think there’s a way to attach a picture here, but that sounds beautiful! I’ve made mats before too by cutting out cereal boxes and gluing burlap to them to make burlap mats. It worked! Cheap invention for the win! I think the electrical panel camo is pretty brilliant. Honestly, I never even saw it till you took a close up photo! And if you can’t get to it when you need it, that’s more of a problem than it being less than pretty. Thank you! Exactly. We don’t want to leave anything to chance. I’ve seen some people put a large canvas on top of theirs on a hinge like a second door or hang a shutter to completely cover it, but that just makes me nervous. What if there’s a fire or a flood? You just never know. Girl….you are so darn resourceful! This is why I love your blog. First I would have never thought to look for laundry art at the Library of Congress and second, I would have never thought of using magnets to attached the frames to the electrical box door. Ingenious I say! Your blog always makes me feel like “I can do this!”. Thank you my friend. Were you peeking in my laundry room? ? Several years ago we were in Croatia and I took a photo of laundry hanging out to dry. When I got home, I thought laundry…laundry room….why not hang it in there? Now every time we travel, I take pictures of laundry on clotheslines and add them to my wall! Now if I could just get the rest of my house to look like yours…. Looks great, I’d have never noticed a problem with the spacing and even going back after reading your comment I still really don’t see it. I’m so glad to know that you can paint an electrical box!! I hate the one in my kitchen. ‘Paint the electrical box’ is officially moved to the top of the project list! 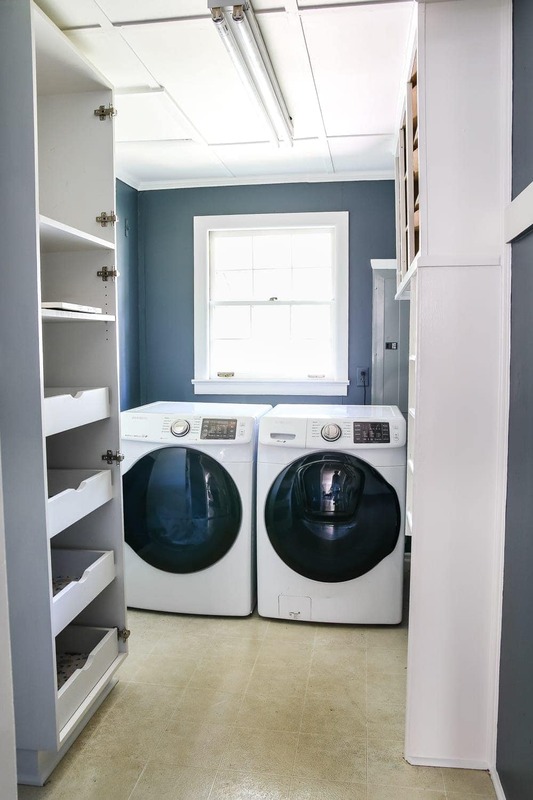 I like your laundry room. I hung 4 Blue Dog calendar prints in the cabana bath because I had blue towels and blue jars on the vanity and was not in the mood to shop for art. Calendar prints and stock prints/quick phone pics (my gardenia is good for this) are my go-to sources. One of my co-workers is on a France and Italy tour – I am anxious to take her pics and use the watercolor app for more art. My big old electrical box is also painted to try to blend it in the laundry room wall Kind of like hiding an elephant in the strawberry patch!!! This is looking gorgeous! Loving the colour and all the little extras! 🙂 Nicely done. I did the exact same thing with Parisian calendar pages for our master bath and my office at work. I’ve been a “francophile” since I was 8 years old (wow, almost 40 years!) and my husband surprised me with a trip to Paris for our honeymoon many years ago, so I always have to have a touch of something French in my world. I’ve also used many book pages and some free printables over the years for cheap artwork, but I never thought of checking out the Library of Congress. Thanks for the great idea! Before you paint your laundry room vinyl floor, please check that it has not become porous with age. If you paint the vinyl and then, for some reason, your washer floods again, will the old vinyl soak up the soapy water which will cause your paint to bubble and separate from the vinyl leaving you with an even bigger mess? I’ve been looking at other flooring options today as another route, and the more I look around at the designs, the more of a fan I become. Jury’s still out. We’ll see what happens. I agree, the leaky washer on top of a painted floor concerns me. 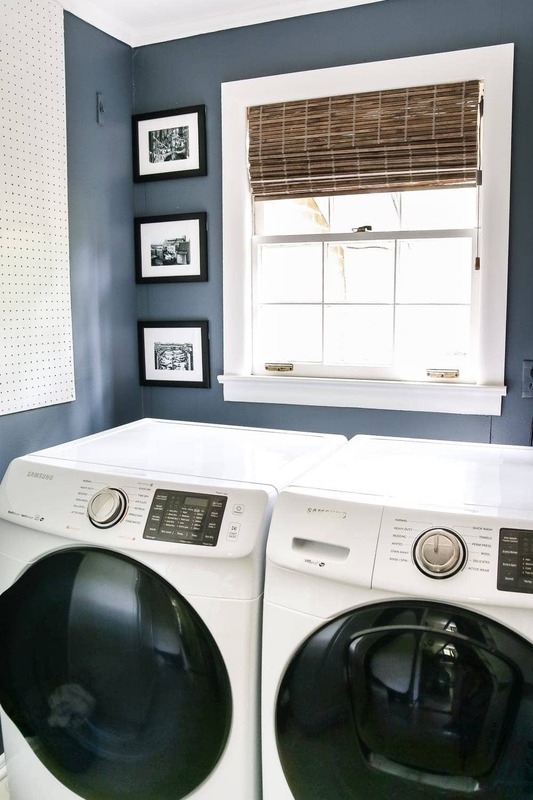 Who would have ever thought that pictures of other people’s laundry in a laundry room would be so cute?!?! Totally genius. Kudos to another incredibly creative and well thought out decorating idea. Keep ’em coming! ? You have a very classy laundry room. I made mine fun the last time we painted. Bright lavender. I also found a picture of my mom hanging clothes on the line circa 1950’s that I hung in there. You smart, creative girl! Those prints are just the best! I remember my mom always had a clothesline, even after she got a dryer, and she made a cute clothespin bag for it. How I wish I had that! There are some very pretty options in solid vinyl planks that are simple to put down, and totally waterproof, perfect for laundry and basement. They click together like laminate flooring. Vinyl has come a long way. You could replace that flooring in an afternoon, and have a fresh start for your newly designed laundry. Lowes and Home Dept both have them. Maybe they will sponsor your new floor! I LOVE LOVE LOVE the paint color!! 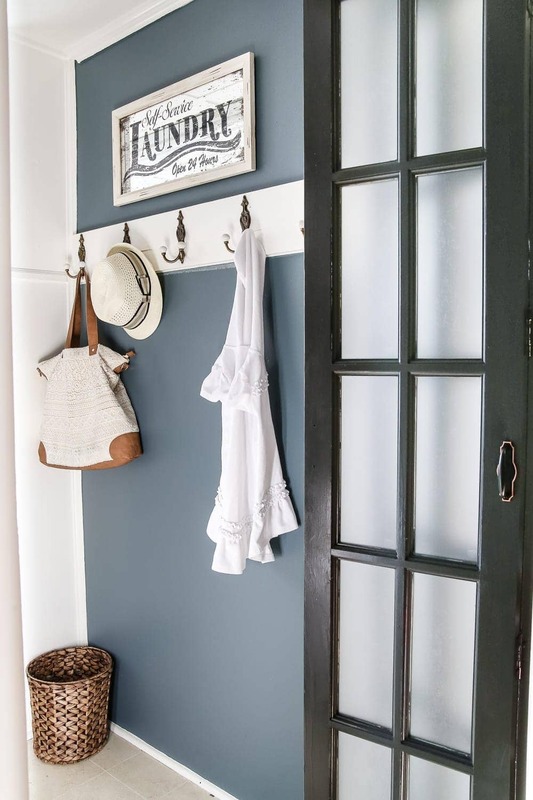 We have a small laundry closet redo in our near future and we’ll DEFINITELY be using SW slate tile! And a few of your other amazing ideas!! Thank you for sharing all you do!! ❤it!! Yes, I never saw the electrical panel until you pointed it out. It’ll do! You are soooo clever! I love all your ideas. Wow, what a difference and so beautiful! Thank you for the info on the art, I went and looked and looked and looked lol. I just hung a new clothesline outside, I lovvvve the smell of freshly dried sheets and blankets and loved what you said about how doing laundry connects us to people from the past and really for that matter everyone. I hope you get your plumbing issues sorted out quickly. I look forward to the flooring that you’re thinking of now. God Bless! You have such a creative mind! I hope I can be as creative as you! I’m very interested in your swap for the lovely florescent bulb with no cover. I have a similar awful one in my laundry and low ceilings so have struggled with “what to do???”. Finally came across one on Pinterest that had 2 small can lights. BINGO! Can’t wait to do mine!! Great makeover! Thanks for the tip about free printables from the Library of Congress. I will be downloading the laundry prints for our own laundry area. Thanks for sharing! Years ago in my kitchen in a rented townhouse, I had a white vinyl floor embossed with purple squares with a small heart at each corner f each square. The embossed colour was purple and my kitchen colours were dusty rose, green and ivory…. I took soft teal green oil based paint and painted a section. It looked awful. I started scrubbing it off with steel wool and it all came up fairly easily – except for where the embossed purple squares were. It looked fabulous! I ended up painting the small hearts with a dusty rose oil paint. The floor looked totally custom designed to my colour palette. It lasted for at least 5 years. I eventually replaced the floor with with ceramic tile. It wore very well. This was way before Pinterest! Now there are so many creative options to paint a floor. If you are going to change it (as I planed to do if it didn’t work, I had nothing to lose) I would say go for it. I used leftover paint so the cost was just my labour. I just replaced my basement carpet with oak coloured LVP or luxury vinyl plank flooring. 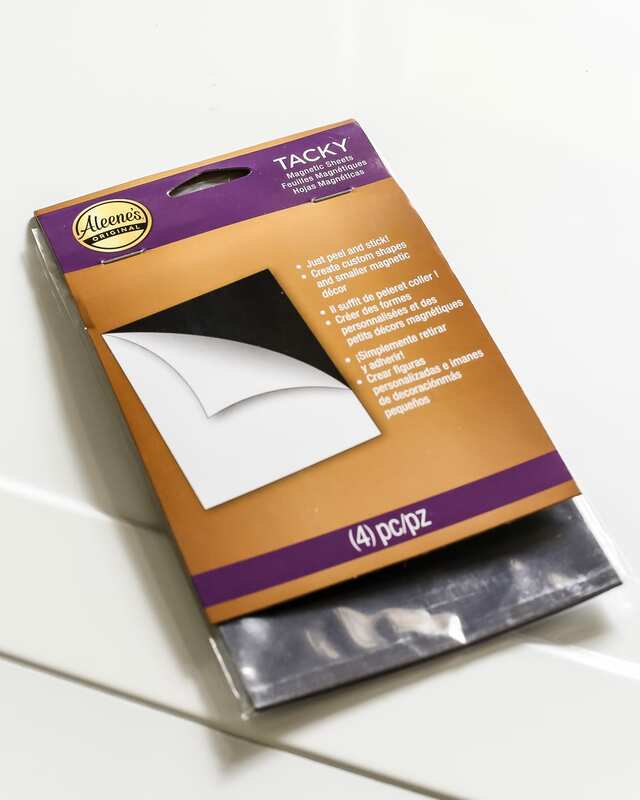 A great, easy care option which looks great and wears well and would withstand water spills and backups well. I don’t want to spend ages going through the library of congress…is there a way fo you so send me the download even though I am already subscribed? I was wondering if you had the printables printed at Office Max or Staples or if you just did them on your own printer. I actually sent them off to Walgreens to be printed on photo paper. You could do it from your own printer, sure. OMG, your ideas are so great. Love the simple inexpensive ideas you have. Now how do you hide downspouts that ugly up the outside of a home? Check out the graphics fairy for a huge selection of amazing prints. She is adding more to her website so check it out! Hope you like it!